This holiday honors the deceased by assembling a shrine with their favorite foods, flowers, and other articles that a person liked when they were living. Mango guacamole is spicy with a touch of sweetness from the fruit. Avocados are smashed with chiles, lime, and fresh cilnatro. If you do not have access to amngo, feel free to substitute with pomegranate. This favorite food is a must-have at any Day of the Dead celebration with fresh and crunchy tortilla chips. Pipian, a Mexican pumpkin seed sauce, is a no-cook a green sauce made with toasted pumpkin seeds or pepitas, cumin, garlic, chiles, and cilantro. It is a piquant, nutty, and rich in flavor. You can use this sauce as a rub for meat, pour over enchiladas, or served over poached fish or pulled chicken. Calabaza en Tacha is a traditional Day of the Dead treat that consists of chunks of bright orange pumpkin cooked in a spiced syrup. It is usually served with crema de leche (Mexican cream) and a drizzle of the sweet syrup. You can also serve candied pumpkin with vanilla or cinnamon ice cream. Pan de Muerto is a sweet yeast dough flavored with anise or orange that is made into shapes that resemble a pile of bones. It is then covered in sugar to add extra sweetness and texture. Families leave a loaf of "bread of the dead" at the graves of loved ones who have passed. 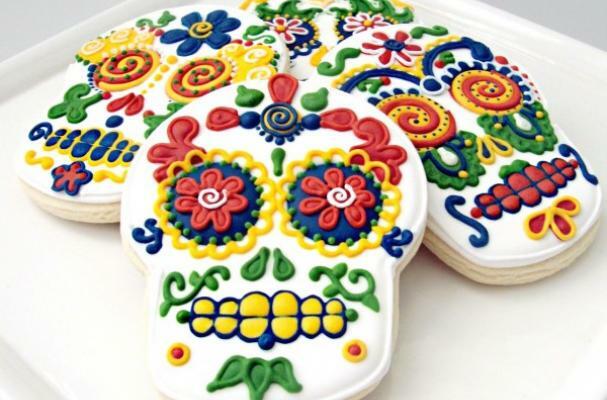 No Day of Dead celebration is complete without a sugar skull, or calavera. These ornately decorated skulls are the international symbol for this Mexican holiday. For these cookies, you will need royal icing in various bright colors and a piping bag. It's important to allow the white base to completely dry before adding on the accents.